Established in 1901, the Gault building, an example of the Richardsonian Romanesque architecture style, was constructed for the Gault Brothers Company, a dry goods wholesaler. 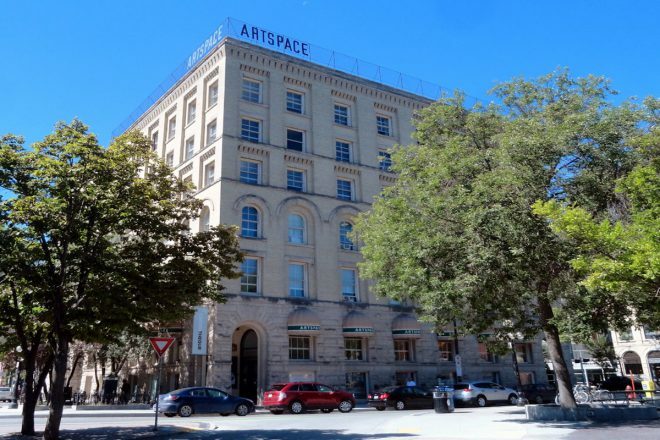 In 1986, the space transformed into Artspace, a multi-disciplinary arts centre and home to a number of arts organizations. The tour begins in the lobby with a walk around the perimeter, showcasing the fish covered drayway. Next, the guide leads you to our rooftop. Along the way, the tour stops for a reading engagement with a Manitoba Writers’ Guild member. After enjoying our rooftop view of Winnipeg’s historic Exchange District, you may visit any of our participating galleries. Please note the rooftop is NOT wheelchair accessible. Guided tours will run every 15 minutes from 12:00am to 4:30pm, lasting 30 minutes, maximum 10 participants.